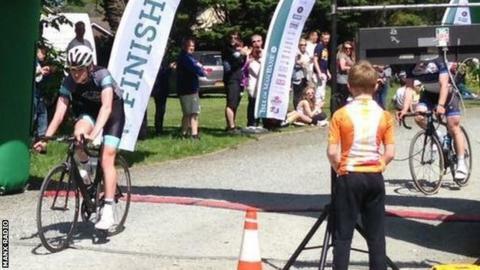 Isle of Man teenager Owen Dudley won the Isle of Man Cyclefest's Grand Fondo to add to his Storm the Tower victory. The 17-year-old edged out fellow Manx rider Robin Garry in a sprint finish after the gruelling 82-mile (130 km) race on closed roads. Dudley finished in three hours, 51 minutes and 59 seconds, one second ahead of Garry, with Martin Ford third. Professional cyclist Anna Christian, from the Isle of Man, won the women's race in four hours 33 minutes. Dudley, from Port Erin, had already won Saturday's 1.5 mile (2.4 km) 'Storming the Tower' hill climb race. His time of five minutes and 26 seconds was five seconds quicker than Liverpool's Philip Williams, with Adam Scarffe third. The race also saw former Paralympian Ian Sharpe - who is registered blind - complete the course in eight minutes 45 seconds. Former professional rider Rob Holden rode alongside the Isle of Man's most successful Olympian, to guide him up the twisting course. Meanwhile, Elizabeth Holden won the women's race in six minutes, 58 seconds, while Elliot Baxter won the 'Battle of Sky Hill' mountain bike race in 46 minutes 19 seconds. The Commonwealth Games rider finished two minutes, 26 seconds ahead of Simon Skillicorn, with Paul Buchanan third. The result meant Baxter claimed the overall title for the three combined events, with women's mountain bike winner Julie Lyness topping the women's general classification.